I have personally done the Y-DNA, the add-on Y-block with FamilyTreeDNA, mtDNA, and new FamilyFinder/AncestryDNA (via Ancestry) which i plan in transferring to FamilyTreeDNA just recently as a base line. I have a long way to go to understand how to process the results and the little colorful infopack from Ancestry.com on my Y-DNA and mtDNA tests were just worthless, but I would like to still think it is valuable to have the DNA raw results. I am not completely clear on the next steps (and at this exact moment not concerned with that) but as I learn more about it and the usage of it in general evolves I do not want to 'lose access to information' as people pass, which is a concern with any research and would like to collect as much valuable information now while it is available. Both of my parents are still living and my oldest living ancestors in my family in their late 50s but only one of my grandparents are surviving. A) I have my 93 year old grand father on my father's side. B) I have the sister of my grand mother on my father's side in her late 80s. C) I have the sister of my grand father on my mother's side in her late 80s. D) I have my mother as the oldest ancestor on my mother's side for females. E) There is a big void in my family trees pre-1800 on many lines and I have been able to make contact with several individuals that "may" be related but their family line lost the last name usually with their parents or their grand parents. Many of these are in their late 50s or 60s and have agreed to take AncestryDNA test if it might be useful for my research. My questions are related to resolution basically and the generational loss of detail that my results would not provide with each generation. How much more additional benefit would I gain by having each of the individuals above (A-E) take Autosomal DNA test (via Ancestry or FamilyTreeDNA for example) ? Would the Autosomal be the 'best bang for the buck' test to request for each of them or should I have the oldest ones take a different test? Would having someone in group E take the Autosomal DNA test facilitate determination of how many generations ago we shared an ancestor, if at all or at least give a ballpark? Update: Added Graphic 11/28/2015 To Illustrate what I am trying to link: AS AN EXAMPLE of one of the many things I am trying to tie together: I am a member of the 'J.S.' line, I have members of the 'C.S.' line willing to take the test lined up. We are trying to determine at this point primarily if 'C.S.' and 'J.S.' lines share a common ancestor. Both lines are trying to determine if we are related to the 'M.S.' or 'P.S.' lines but are unsure if DNA testing will really provide any great value in answering this testing at this point due to dilution, and if so what test should we be performing and on whom. The 'C.S' line we do not have a direct male descendant line but the 'J.S.' line does. You're probably already aware of this, but Ancestry recently changed the manner in which DNA test results and tree matches are shown to customers. Crista Cowan reviewed the changes in a video AncestryDNA: Cousin Matches and DNA Circles; DearMYRTLE also discussed the changes in her 24 Nov 2014 episode of Mondays with Myrt -- this link is to the timestamped version, so you can go directly to the relevant segment at 17:36. Under the video there are links to other bloggers, including Judy D. Russell's post Changes at AncestryDNA: The good, the bad and the ugly. If you have tested there, I encourage you to download all match lists and raw test results from Ancestry ASAP while your data is still available for you to access. There is also a white paper available to people who have tested via AncestryDNA, which explains all the recent changes. A disclaimer: I am far from an expert on DNA testing -- I think it's fair to call myself a skeptic, especially with results from companies like Ancestry which do not reveal how you match to other individuals in the database. Most of my readings in DNA have been books and articles about specific traits which discuss specific alleles, so the matches which express only a percentage range seem way too fuzzy to me. People test at AncestryDNA because it sounds fun. Because they want the warm fuzzy experience. The company gives you fun colorful graphs of what countries your ethnicity derives (which I have already stated is as accurate as measuring a doorway with a cat.) Further, if you find matches with others using AncestryDNA, the tool they use to show you how you are related is by comparing your family trees to each other. And if you are matched with someone with shoddy research or no family tree, the results are meaningless. Lastly, having matching DNA segments and knowing you have a common ancestor is great, but it is a dangerous assumption to think that they go hand in hand. That is why triangulation with another researcher with the same common ancestor is necessary to see if you all share the same strand of DNA at the same chromosomal location. This is something you cannot do at AncestryDNA. My question to you is -- how many generations back is your "pre-1800" void? If I recall correctly, in one of the recent videos, Angie Bush told DearMYRTLE that the results for autosomal were good to about six generations back (see link in the resource list). The big problem is that you may have a match in your paper-trail trees with a lot of people, and a DNA match, but there's no guarantee that your DNA match is because of the line in your paper trail -- you could match via some other means which you are not aware of, especially if you're talking about distant cousins, and both of you have gaps in your paper-trail trees. See How Much of Your Family Tree Do You Know? And Why Does That Matter? by Blaine Bettinger (the pointer to this article was shared by Debbie Kennett). My personal feeling is that while the autosomal DNA information is fascinating, and interesting to explore in its own right, it's important not to put too much emphasis on it. The deck of cards shuffles so much with each generation, it's possible for distant cousins to be related to you but share no DNA just because of the way the chromosomes fell. I think your question is an important one -- if your relatives are willing, you don't want to lose their information by waiting too long (which is true of all family history information). Here are some criteria I would use to choose test priorities and my reasoning for each one. Just like paper trail research, choose your test by what information the test will give you, and what questions you most want to answer. Disclaimer: my personal bias against autosomal tests where I can't see the raw data is reflected in this list. Which company offers the best takeout of the data? A lot of people got burned because their Y-DNA data and mtDNA data got locked up when Ancestry dropped those tests. If you have older relatives pass and their data is tossed, you can't go back and ask them for a fresh sample. Your 93 year old grand father on your father's side (barring an unknown 'non-parental event') will probably match yours. Do you want two data points for that line instead of just one? For autosomal tests, I suggest starting with yourself and group A-D. Think of it as establishing a baseline against which the people in group E could be judged. My reasoning is that you say "I have a long way to go to understand how to process the results". It makes more sense to me to learn by comparing the test results from your known relatives in A-D first, before you ask any of your group E people to take more tests. See Triangulation for Autosomal DNA and the other articles about Triangulation on Roberta Estes' blog, DNAeXplained – Genetic Genealogy. However, since I am a complete rookie at this, my reasoning could be completely wrong -- a sensible person would ask advice from someone much more familiar with the tests, like Judy G. Russell or the other bloggers listed in my resources list. Like all family history research, one can often make better progress with specific, focused research questions than with wide global searches. As Judy G. Russell says in her post "It isn't so", "DNA testing only works with traditional paper trail genealogy, not instead of it!" So use what you learn from the tests of your own family to help you decide which test results would be most useful from the people in your group E.
Michael Lacopo's, Hoosier Daddy? -- if for no other reason, it's a great example of how to write a cliff-hanger! The link should take you to the first post, "Beginnings". Genetic Genealogy Links & Resources by Louise Coakley (thanks to Debbie Kennett for sharing the link to this post). "How I DNA" -- a new series by SallySearches. Part One posted 28 Sep 2015 has a chart summarizing the companies that her family members have tested with and where the results have been transferred. Making a chart like this seems like a good idea when you are comparing test results from several people. This section has links which specifically address the concerns in the current question title, "Generational Loss of Data with DNA Testing". The following quotes are from the Learning Center at Family Tree DNA. The Family Finder is Family Tree DNA's name for their autosomal test. Q: How many generations does Family Finder analyze or predict? The Family Finder program determines relationships for up to five generations. We will return data and matches that are more distant. However, we established the confidence interval based on the level of quality to which Family Tree DNA customers deserve and expect. If you are trying to confirm a relationship with someone else who is a 3rd cousin or closer, the Family Finder test is recommended. We will provide you with names, email address, and the genealogical information your matches have shared. You will be able to communicate with them freely to find your common ancestors. Please note this test cannot distinguish between matches from your mother’s side versus your father’s side. Q: How many generations back does mitochondrial DNA (mtDNA) testing trace? Mitochondrial DNA testing at Family Tree DNA also includes haplogroup testing. Your haplogroup represents your ancestral origins thousands and tens of thousands of years ago. Paternal line DNA testing uses STR markers. STR markers are places where your genetic code has a variable number of repeated parts. STR marker values change slowly from one generation to the next. Testing multiple markers gives us distinctive result sets. These sets form signatures for a paternal lineage. We compare your set of results to those of other men in our database. The range of possible generations before you share a common ancestor with a match depends on the level of test you take. A match may be recent, but it may also be hundreds of years in the past. More information is available at their Learning Center and in their Recommended Reading section. Also, there may be information that can help you make a decision in the other questions here tagged dna. Inbreeding, Pedigree Size, and the Most Recent Common Ancestor of Humanity by Joseph Lachance, published in J Theor Biol. 2009 Nov 21; 261(2): 238–247 discusses how pedigree collapse changes the calculation of the most recent common ancestor (MRCA) of humanity. For the problem of why you might get a match for Y-DNA or mt-DNA tests but not see the person in an autosomal match list at Family Tree DNA, see Why is the chair empty? posted Dec 3, 2017 (in which she discusses the differences in 'reach' between autosomal and Y-DNA and mt-DNA tests). I am not an expert on DNA testing. But I learnt (and still learn) a lot through the story of Michael Lacopo at his blog "Hoosier Daddy?" where he blogs about how (tries) to find the biological father of his mother. The smaller the numbers the more difficult is it to determine an exact relationship. Overall (my own opinion) testing either your grandfather or your grand aunts (or all of them) kind of "casts" the net of autosomal DNA the widest. But still your possible connections (E) may be too "far away" to get a significant DNA share. What's the benefit of A-E for Autosomal? 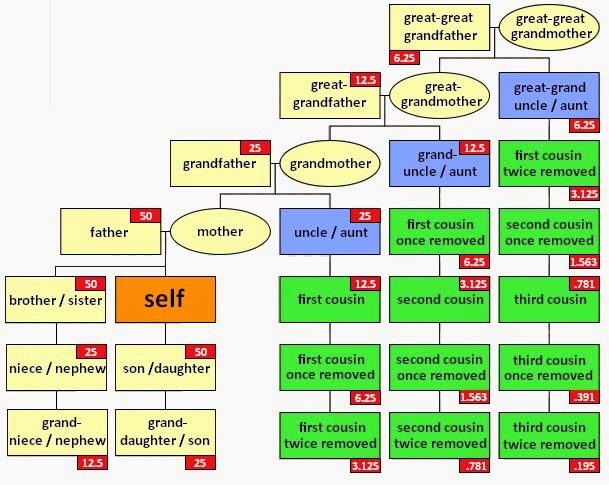 Autosomal testing is excellent for finding relatives in non-endogamous families up to about 5th cousins which is about 12 generational steps away, 6 steps up and 6 steps down again. By going back to your parents or grandparents, you gain an extra step or 2, which doesn't gain that much. Maybe you'll get a few more distant matches, but that is about all. However there is a real benefit to getting your four sides tested. From your own autosomal test, you can tell you've found a cousin, but you can't tell which side they're on. With an additional person on each side, you'll be able to narrow down which side and which set of ancestors that cousin may be related to. There is no real use to soliciting your E group if you are talking about pre-1800 lines. That is stretching the limit as to what autosomal testing can do. Is Autosomal best bang for the buck? It would be helpful to test as many of your close relatives (up to say 4th cousins) as you can. Doing so identifies where new matches fit into your family. And when you start to do more advanced work, can help you triangulate to "prove" relationships, and reconstruct parts of the DNA of some of your long-dead ancestors. Autosomal does all lines of your family. Y-DNA only does your one male line, and mt-DNA only does your one female line. Those are interesting for yourself to see where you fit in into human origins. But you only need them out of relatives if you want to prove a connection to one of your ancestors. If it is an ancestor on your own paternal or maternal line, then your own Y-DNA or mt-DNA will do. But you will need a suspected direct male or direct female descendant on their side to test against. If it is one of your other ancestors, then your own Y-DNA and mt-DNA tests won't do. You'll need a relative you know is a direct male or female descendent of the ancestor you're interested in, to compare against the suspected male or female descendant on their side. Would group E Autosomal facilitate determination of generations ago you shared an ancestor? Only if they are within the 12 generational steps. The match results of the companies will usually suggest whether they're likely 2nd, 3rd, 4th or 5th cousins. Not the answer you're looking for? Browse other questions tagged dna autosomal-dna y-dna or ask your own question. Why would Native American Ethnicity not show up in Autosomal DNA results? Is the Autosomal DNA testing ever wrong on relationships? Is ancestry.com DNA test accurate with respect to native american descent? How likely is it that ftDNA made a mistake about my y-haplogroup? Finding my Great-Grandfather when DNA test not conclusive? Making Research Plans for studying the Genetic Genealogy of an Adoptee? What would the starting shared cM number be for abnormally close relationships in Autosomal DNA test? How to effectively communicate your tree for DNA Matches in first contact emails? Can I get genealogical DNA-testing done on an old blood stain? 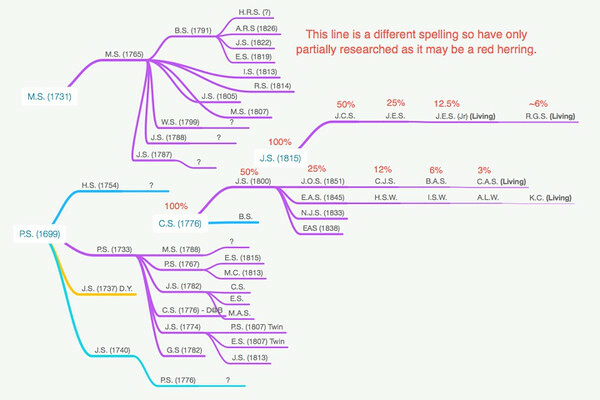 How to interpret a reasonable X DNA Match, but no shared cM Autosomal result on GEDMatch? Forensic Y-STR DNA test provider that can provide results at greater than a Y-37? How to get permission and best order to upgrade DNA testing for deceased person? Is there value in doing an mtDNA for a first cousin once removed? Acceptable number of no-calls in autosomal DNA test results? How to narrow down the best DNA donors in a large family?